Maui helicopter tours will show you the 75% of the island that you will not be able to see from any vantage point on the ground. We often recommend that you take a helicopter flight on your first or second day on island so you can get your bearings and decide which beautiful parts of the island you would like to go back and further explore. Tom Barefoot's Tours offers many helicopter tours at discount pricing. 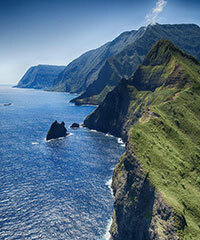 What regions will you see on the Maui Helicopter Tours? Here are the main options. 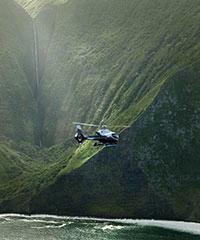 This is perhaps our most popular Maui Helicopter tour and with good reason. From your departure from the heliport in central Maui you will ascend through the 'upcountry' area of Maui famous for its rich agricultural heritage in route to the top of our 10,000 dormant volcano of Haleakala. Once you arrive at the top you will be amazed to see a 3000' crater that spans 21 miles in circumference and is every bit as much of a 'moonscape' as you could possibly imagine. Giant cinder cones raise hundreds of feet from the crater floor and you get your first real glimpse back in time to the source of Maui's creation. As bold as it is stark, this site will live in your memory forever.The second half of this tour will drop you down to sea level off the back side of the island along the large expanse of the Kaupo Gap and within minutes you will find yourself immersed in the emerald green dripping jungle landscape of the rain forests of Hana. Waterfalls and rainbows abound in a wonderland suitable for unicorns and fairy tales. The seacoast here is one of the most remarkable to be found in all of Hawaii. The top of the West Maui Mountains at Puu Kukui is often the wettest spot on Earth. Like spokes of a wheel the razor thin ridges descend toward each direction of the compass to the sea. The many valleys which divide this mountain have sheer walls on each side and waterfalls often reaching 3000' in height will free fall to the pools below. Just three or four miles as a crow flies from the cities of Lahaina and Wailuku you will find yourself in a time warp of sorts in an area seemingly reserved for dinosaurs and prehistoric beasts. 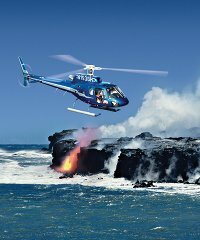 This is Maui's premier helicopter flight as it combines the best of the Hana/Crater tour and the West Maui Mountain tour both described above. 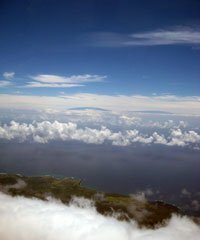 This tour is a little extra money then either of the other tours but once you have completed this flight you'll have an understanding of how the entire island has been put together. 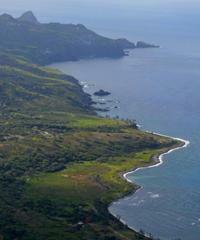 The island located just eight miles off the northern coastline of Maui is the island of Molokai. This is the home of Father Damien's famous Leper Colony which is located on the most beautiful peninsula ever created on God's green earth. Flying along the northern coastline of Molokai you will visit the highest free falling waterfalls descending into the ocean to be found anywhere on the planet. If you are lucky enough to be taking this tour in the Winter months you have a good chance of seeing one of the many Humpback Whales that frequent the channel between Maui and Molokai. Returning to Maui you will see the best that the West Maui Mountains have to offer and your mission will be complete. 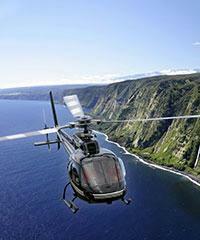 What type of Chopper will you be flying in on your Maui Helicopter Flights? 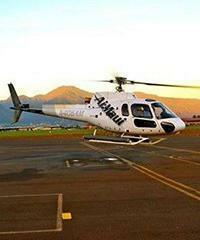 is generally considered the "gold standard" for Maui helicopter tours. No matter where you sit you'll have 180-degree visibility. The rotator shaft does not come between the front and back seats and there are no visual impediments interrupting your view forward. The back seat is raised to give a better view above the seats in front and there is an abundance of windows. is made by the Robinson Helicopter Company and has 4 seats, two front and two behind. All seats have fabulous visibility and this aircraft can be flown with doors on or doors off. The Robinson R44 has the distinction of being the first helicopter navigated by a woman to circumnavigate the globe flying a distance of 36,000 miles in 97 days. is actually the enhanced version of the A-Star and is generally considered the "Cadillac" of the Maui helicopters tour aircraft. These helicopters are wider allowing for all bucket seats for more comfort. They have about 20% more viewing capacity through the larger windows and they produce less noise as from heard from the outside. is often referred to as the limousine helicopter because of its unique seating arrangement. One client sits up front with the pilot, three clients sit in the rear facing forward and two passengers sit in the rear facing backwards. Some of the helicopter companies offer flights with doors off. These are always the ones that professional photographers want because there is no window to look through, it's just 'air all the way'. These are not flights for everyone because you are able to look straight down thousands of feet below right from your seat. If you have no problem with that, you will love these flights. 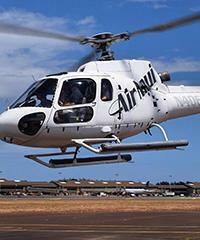 Helicopter Maui Tours do not pick up at the cruise ship but may be easily reached by taking a short taxi ride from the cruise ship at Kahului Harbor to the Kahului Heliport. View the 'restrictions' area after you click on each of the companies offering Maui Helicopter tours listed below for specifics regarding the cruise ship itinerary. Fly to the Erupting Volcanoes from Maui! 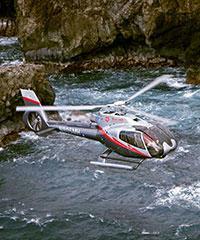 How Can the Weather Affect Your Maui Helicopter Flight? 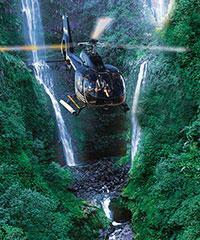 Should you book ahead for your Maui helicopter tour? We have more than 6 people in our party. Can you accommodate us one a Maui helicopter tour? 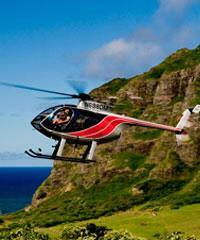 What is the Best Maui Helicopter Tour? This video segment is going to be about helicopter tours on the island of Maui, and in fact in Maui County. Helicopters, without question, are some of the most popular ... always have been ... Activities that we have here. One of the most exciting; also one of the most expensive of the choices of activities you could do, but they are well, well worth it. Let's get a picture here of the islands a little bit. It's often said that somewhere in the neighborhood of 75% of these islands, even a small island like Maui, can really only be seen from the air. You're really not going to be able to see these great places that Maui has to offer without getting into a helicopter or a fixed-wing aircraft. 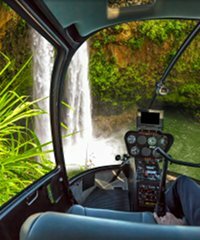 But the most popular that we have of Air Tours in Maui County are going to be the helicopters, and those are, in this case, the very best way to see these various areas. There are so many places that you can't visit or can't see if you don't get up in the air. Also, if you are new to visiting the islands, not only should you go up to see them, but you should really try to get up when you first here, like the first day you're here or something like that. It'll change your entire perspective of what's happening on the island. You don't really get it, quite often, until you get up in the air and then traverse Maui, fly around it. If you do that, if you do the hour tour for instance on Maui, you're going to come back when you land ... you're going to know what the island looks like. Then you'll be able to know where you want to go back and what you want to see. It just kind of puts everything in perspective. You don't quite get that unless you get up in the air to see it. These mountains go up 10,000 feet, 5,000 feet-plus here on West Maui, and they're just kind of hard to understand what really happens up there until you actually take a trip up to see it. 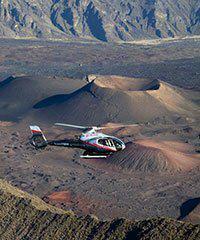 There are a number of tours that you can take, helicopter-wise, on Maui. Generally you can break them down into just a few to make it simple. The island of Maui itself will have the complete island tour. That's usually about 60 minutes. If you divide West Maui off here, you have what is called the crater and Hana tour. That's generally 45 minutes. Although it's not done very often, just this portion of the island is called the West Mauis, and that would be maybe a 30-minute tour. 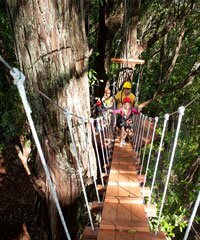 The other tour that is very popular is one that goes over to visit Molokai over here, and that's usually included with West Maui. 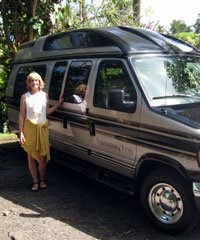 You'd do West Maui and Molokai, the West Maui/Molokai tour. The heliport on the island where you're going to be leaving from is at Kahului at the main airport. It's actually just the other side of the runway. You can see when your planes are departing and when you're getting ready to take off, you look across the runway and you can see the helicopters going up and down. That's where they leave from. What are these tours? What do you actually see in them? Well, let's just take them one by one here. 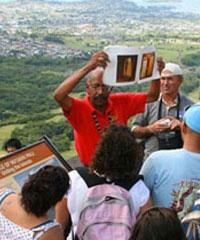 Let's do probably the most popular tour that we have on the island is the Hana crater trip. If this mountain was in relief, if you could see it, this is all Haleakal? here. Haleakal? is a shield volcano that comes up about 10,000 feet, and at the very top is a crater that goes down 3,000 feet and it's enormous. 21 miles in circumference, and we always use the analogy that you can take Manhattan Island, you could put it inside there, to give you an idea of how big that is. What these tours do is they leave from the airport here, they wind their way through the up-country area, very, very beautiful ... Makawao, Kula ... and then you finally get up to the top. You're not allowed to actually go inside the crater in the helicopters, but that doesn't matter. You can go around the periphery of the crater, and you can see everything that you want to see inside. You've got these incredible views. It's like seeing kind of a moonscape, if you will, of beautiful colors. Each time of day is a little bit different. Then they fall off the edge here, kind of going down to the Kaupo area, you've got Kaupo Valley, you've got Kipahulu Valley next door, giant, giant ravines and cliffs, escarpments you see quite often. In Kaupo you'll look on the cliffs and you'll see the little goat families and so on just cruising along on these tiny little pathways. They never seem to fall. 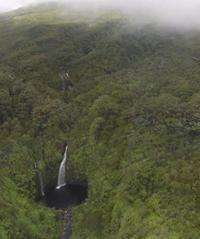 Then you can get into Kipahulu Valley, one of the most rugged and jungly valleys that you'll find anywhere. People don't go in there. It's so rugged and so jungled, and so remote really from the rest of the island ... You've only got a island that's 48 miles long and we're talking about one valley that's remote, but it's so hard to get into that there's actually species of plant life that live in that valley that don't exist anywhere else in the world, not even on either side of the valley. You've got these beautiful terrain that you're looking at, very remote. You've got waterfalls all through this area. Down on the coast you've got this beautiful coastline which works its way into Hana. You kind of overfly this area. This is usually the route that they take. Then follow the coastline this way, kind of halfway inland and halfway over the coast. This is one of the most rugged and beautiful, sought-after coastlines you'll find anywhere on the planet. It's just this cragged ... the coastline ... You've heard of the Hana Highway, and perhaps you've driven it. It's just kind of chiseled along that coastline with these beautiful cliffs that go down all the way. This is all lush, dense, triple-canopy rainforest through here. You've got just jungle dripping from everywhere you could imagine, plus so many pools and streams and waterfalls, big and little, all through this area. Once you're up here and you're at that vantage point, you're realizing why you've never seen ... It would be impossible to see these areas even just driving the Hana coastline, or most people drive the Hana Highway. You're not going to be able to see back in here. You can just kind of look in the distance and go, "Well, there's mountains up there," but from up above, you're seeing so many waterfalls, pools and streams, and jungle. It is absolutely gorgeous. Then they come back. As they get closer to the airport, if you're lucky enough, you'll have a nice day when you can see the surfers out in Ho'okipa, really colorful with all the windsails and that sort of thing. And then they land. That's a 45-minute trip. The complete island trip is the one that includes everything we just looked at here, but also includes West Maui. This is a totally different animal. It's not as high. It's a little over 5,000 feet, but from the top up here, there's a place called Puu Kukui. Like spokes on a wheel, you've got these really defined valleys and ridges that go in each direction down toward the coast. This is one of the wettest spots in the world. Quite often it's the second wettest spot after Mount Waialeale on Kauai. Sometimes it's the first, and has been over the course of years, but it's wet. We get maybe ... and it changes all the time ... but let's just say 360, 370 inches of rainfall a year, like a inch a day. You've got these just incredibly green, green jungles. This area has been worn down by the rain, the clouds, the wind, by so many years. It's been extinct about a million years. It has formed these precipices, these little valleys, ridges that go straight down. On either side of the ridges, you're just falling off sheer. Then in the middle of the valleys, you've got this tremendous jungle areas, but the jungle even grows all the way up to the top of these ridges. There's one place we have in here called the Wall of Tears. Maybe you've got 15, maybe you've got 30 waterfalls, depending on how much rain has been falling, that just kind of weep out of this one wall. With the capability of the helicopters, you can actually get right in there and hover and see this, and then kind of turn around and turn around. It's amazing, and no other machine can get you into a situation where you're going to be able to see that. This is why you take the helicopter tours. What exists back there, it's like no place you've ever seen. If anything, you expect to see dinosaurs or something. It's like the idea end of the earth. It's incredible, yet it's just a five or six-minute flight back to the water in one of these helicopters, but it is really amazing to be seen. This is what you're going to be seeing, in addition to the West Maui, and you get the full circle island on this. The other one that we're talking about is the one that includes what we just talked about now with West Maui, but takes you over to Molokai. You've got this situation where you're going over the channel, so that may take six or seven minutes or something to cruise that. If you're doing it during Whale Season, you're going to see whales down below which is always exciting. But you're going to be going over to Molokai which is very similar to what West Maui looks like in terms of the ridges and the jungles and that sort of thing. But you've also got this amazing 2,000-foot cliffs on the north side here. They also have waterfalls. In fact, they have waterfalls that have the longest free-fall waterfalls in the world that end up in the ocean. That's a sight to behold. 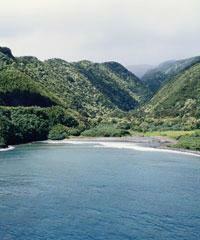 If you continue this coastline far enough, you get to this one area called Kalaupapa. It's a peninsula here, and this is the site of Father Damien's Leper Colony. It is a sight to behold. That ridge that starts here, these cliffs, continue behind this peninsula, and they are what actually protect the peninsula and keep it private. This, of course, was a place that lepers, people who had Hansen's disease, in the mid to late-1800s came. It was a place where they could be put, and they wouldn't be passing on the disease to others, so it was a colony of all these people. But they were fortunate enough to live in one of the most beautiful places on earth, really incredible. You see this all from the helicopter, and then double back and around and come back and see West Maui. Those are usually an hour trip as well. That's pretty much what you're going to be seeing in terms of the various tours. What kind of helicopters are you going to be in? Well, we have different companies and they fly different helicopters. If you were to pick the helicopter that is probably the most popularly used in Hawaii, that's going to be called the AStar helicopter. It is a helicopter that is designed ... it's a French design ... it's designed specifically for the purpose of sightseeing. No matter where you sit on this helicopter, you have 180-degree view. The way it works is you've got two passengers in the front seat and a pilot, and then you've got four passengers on a bench in the back. If you're sitting in the front, you've certainly got nothing in your way to see whatever you're going to see. If you're sitting in the back, what has happened is they've taken the rotator shaft out between the front and the back seat. They've moved it behind the cockpit so it's not in your way, and then they've created kind of a theater seating where they've raised the backseat up higher. You've got this view you can see over anybody in the front seat, plus you can see out the windows on either side. You've got great views. This is really kind of the workhorse of the industry. It's kind of the gold standard for helicopters, I guess. Certainly the most widely used, the AStars. The variation to that is kind of the step up, and this is referred to quite often as the Whisper STARs. It's the same company that makes it, but it's different. Different in the sense that it is ... I'm not exactly sure how much wider. Maybe a foot-and-a-half wider than the AStars? It's wide enough that instead of having a bench seat in the back, everywhere you sit, you've got bucket seats. It's a little bit more comfortable. You have more glass that you can look out, more window space. It's really a little bit more the luxury. It's a little bit more comfortable. Whisper STAR, it's also quieter. Not that you really hear so much the helicopter anyway, inside the helicopter, when you've got the earphones on and such. But those people that are outside the helicopter, it's less noisy, and so it's kind of more ecologically-friendly to the rest of the world. They're going to cost more and be a little bit more expensive for those, but you're getting what you pay for. As far as where you're going to be seated in any helicopter, generally speaking you're going to end up with people that are less weight in the front, more weight in the back. I should mention that always, if you're going to be flying in a helicopter, we're going to have to know your weight. That's how they organize the weights on the helicopter. They kind of put it in a computer and figure out where everybody's going to sit, and everything has to be aerodynamically balanced so it all works out. You can't fib on your weight, and in fact in most places, they'll actually have a scale that they'll ask you to get on as you arrive and get ready to board the helicopters. The smaller weight people generally end up in the front. This is not always the case, but it is often depending on the weights and who's there. And a little bit more weight will be in the back. There is one circumstance on the Whisper STARs where under certain circumstances, you can get what they call a first-class seat if you're a little bit heavier, which is like in the 250-pound ... over 250, and you pay extra, usually about a ticket-and-a-half price, and you can sit in the front. Somehow they do the weights, they can arrange it special for you. That's special circumstances. Other than that one choice, you're going to be your weight. You're going to be who you are. You're going to tell them what your weight is, and you're going to sit where they tell you to sit, and that's the way it's going to be. Fortunately, you've got great seats on all of these anyway. The other helicopters that we often have on Maui are the Hughes 500s. These only sit four passengers, two in the front, two in the back, and on these, they're kind of neat. You can pull the doors off if you choose to, and enjoy the flight. The other one that is used on Maui is called the Robinson. The Robinson is completely different in the sense that it's a much smaller helicopter. It only takes a maximum of three people, and quite often it's really only two. You've got a pilot and one other person in the front seat, and then you got somebody in the back seat, or you could have two people in the back seat, but generally it seems that people come in twos, so you end up with a couple people. So what do you have? If it's just the two of you, you've got sort of your own private flight which is neat. Also on these, they also can pop the doors off. They charge, I think, maybe $25 more or something like that to pull the doors off. But this is a flight that is very popular among photographers because you've got nothing between you and beautiful Maui, except air. It is kind of the photographer's choice, and a really, really neat way to see Maui. That's the nuts and bolts basically ... the thing went off just in time ... of helicopter tours on the island of Maui. They're fantastic. If you can arrange to do them, you should. They're really special.